Harry Pearce joined Pentagram’s London office as a partner in 2006, having co-founded and grown Lippa Pearce to become one of the UK’s most respected design agencies during the previous 16 years. His work touches many disciplines, from spatial design and identity to print, packaging, and posters. Encompassing the public and private sectors, local and global charities, and commercial enterprises, his diverse clients include, in the UK, Boots, The Co-operative, Halfords, Waitrose, Sainsbury’s, Anish Kapoor and the 2011 Summer Exhibition at the Royal Academy of Arts, Phaidon Press, and the London Science Museum; as well as Saks Fifth Avenue, the United Nations, and the Russian police force. Pearce is also a member of the advisory board for Witness, working with Peter Gabriel for the human rights charity for more than 17 years. In 2009 HarperCollins published Pearce's first book, a collection of typographic nonsense titled Conundrums. 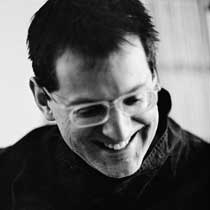 He regularly speaks at major international design conferences across the globe, including AGIdeas, Australia; Design Indaba, South Africa; Semi Permanent, New Zealand; and Design Yatra, India. Speaking engagements have also taken him to New York and Chicago, as well as to colleges, museums, and the Typographic Circle in the UK. He is an active member of Alliance Graphique International. Jung’s Memories, Dreams, Reflections, a “bright orange sketchbook,” and the book he can’t stand are among Harry Pearce’s answers to The Proust Questionnaire—Book Edition.